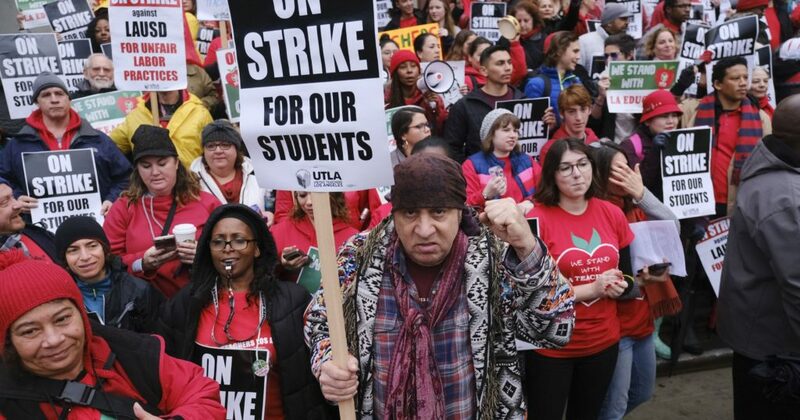 By and large, media coverage of the Los Angeles teachers strike represents a big improvement. 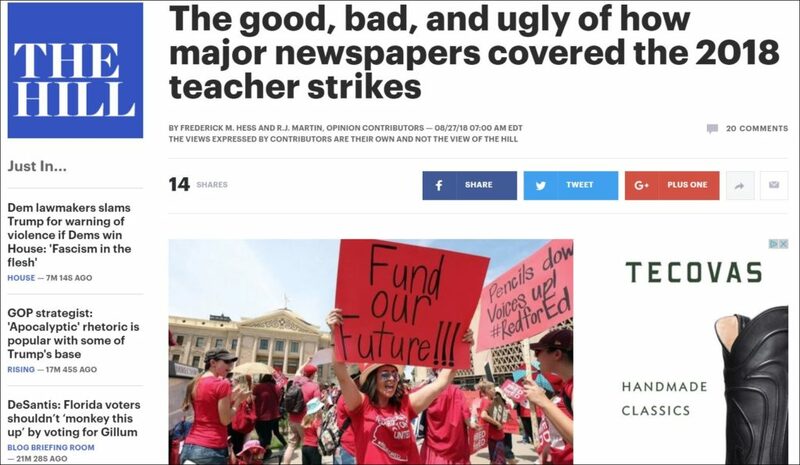 Well done, journalists who covered the Los Angeles teacher strike over the past week plus. Varied, largely accurate, and reasonably thorough, your coverage opened readers’ eyes to important issues and went beyond the immediate spectacle of a citywide strike. You went behind the scenes, made a robust effort to capture the complicated experiences of teachers, students, and parents. These are some of the key elements of how high-quality strike coverage should be done — an effort that represents a big improvement over some of the coverage of last year’s strikes. Local and otherwise, news outlets put enormous resources into covering the six-day strike that ended last night. Here are some of the many reporters who covered the strike, including the LA Times’ Howard Blume (top left), who decried the prevalence of “hyperbole, passion, and spin” in the leadup to the strike. Some of the best pieces that I came across featured important angles on the main storyline and presented complex realities rather than simplified storylines. The Los Angeles Daily News’ Ariella Plachta described the strike experience at two contrasting schools, highlighting the privilege that some parents enjoyed of being able to join teachers and keep kids home. The LA Times’s Howard Blume and Doug Smith wrote an extremely helpful day three overview capturing both the “heady” experience of striking teachers basking in the support they were receiving from parents and politicians and the “increasing pressure” for the union to settle. KPCC’s Kyle Stokes weighed in with a close look at the “class size conundrum,” which pits the popularity of smaller class sizes among parents and teachers against the financial and logistical obstacles, as well as mixed research on the outcomes. The LA Times’s Sonali Kohli wrote a great profile showing how a striking teacher’s family was handling the logistics of childcare, picketing duties, and all the rest. I could go on, but the point is clear: Reporters got into schools, talked to teachers, parents, and students, and explored important differences and complexities. They found interesting angles and perspectives from which to report about the strike, rather than focusing narrowly on press conferences, protest events, and political conflicts. Local outlets like KCET explored what was going on in schools during the days when teachers were out on strike. Local outlets weren’t alone in producing high-quality work. The New York Times’s day one story by Jennifer Medina and Dana Goldstein was an excellent roundup for readers who weren’t already familiar with the circumstances and dynamics behind the disruption. Alia Wong’s piece in The Atlantic about the unusually diverse teacher demographics in LAUSD, compared with many other places, was a helpful addition. Latino educators account for 43 percent of LAUSD’s teaching force this school year – much higher than in many other big-city school systems. And USA Today’s Kristin Lam wrote an eye-opening story about the strike’s impact on the district’s 62,500 students with special needs, featuring parents making difficult decisions for children whose needs were unlikely to be met at schools staffed by a skeleton staff of substitute teachers and administrators. This, folks, is what makes strike coverage work. Media outlets went well beyond the obvious visual appeal of protesting teachers and celebrities who supported them. The coverage wasn’t flawless, of course. Some observers felt that it lacked selectivity and creativity. “It seems like half the reporters in the city are standing outside of schools in the rain photographing signs and trying to talk to teachers,” said one local journalist about the day one coverage. Some of the national stories tried too hard to link last year’s red-state walkouts with this blue-state district strike. Sure, they’re all teacher strikes, but a much more relevant comparison would be the teachers strike in Chicago back in 2012, which was in many ways the template what happened in LA. There were also some unfortunate and entirely preventable errors in national coverage, especially around the role of charter schools. The New York Times’s January 9 preview of the strike required a correction regarding charter school students demographics, which resemble LAUSD demographics. A New Yorker piece erroneously blamed the district’s enrollment decline/budget hole on wealthy parents choosing charter schools. 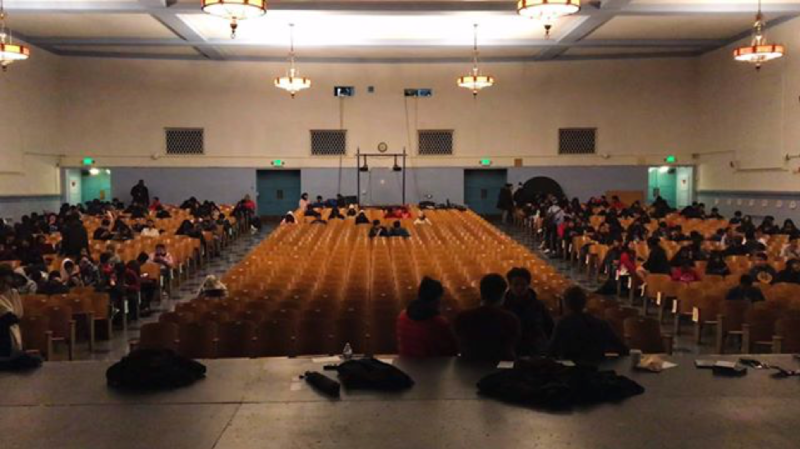 And few of the stories framed the strike within a simplistic, two-dimensional narrative, pitting the teachers against the district, or charter schools against district ones, or progressives against moderates, simplifying viewpoints that, in a district as vast as LAUSD, vary widely. Observers criticized national coverage of last year’s strikes for being late to the story and then giving too little voice to parents and students. Some of the usual criticisms came up during the strike concerning the former associations between the LA Times, LAUSD superintendent Beutner, and the pro-charter Broad foundation (which has funded The Grade in the past). Beutner headed the LA Times at one point, and the paper received a two-year grant from a handful of foundations including Broad. This challenge of figuring out how to write about contentious issues without resorting to “he said, she said” kinds of coverage that many readers find frustrating and that has come up in the past. In the runup to the vote over Massachusetts’ 2016 charter school expansion measure, for example, reporters were “unable to settle what became the debate’s central question,” which was whether or not charter schools drain funding from district schools. There are other important areas of concern regarding the LAUSD strike coverage: Was there enough coverage of schools in communities where the dominant language isn’t English? 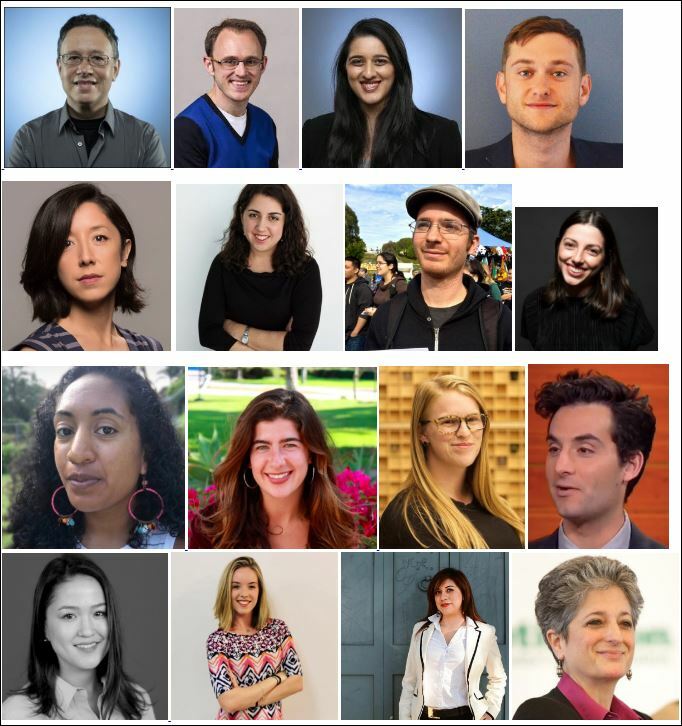 Was there enough coverage by reporters who aren’t white? How is the district is going to pay for the things it’s now agreed to do? 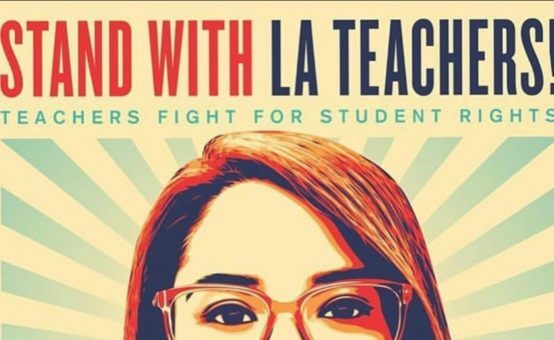 The LA Times’ Andrea Castillo profiled Roxana Dueñas, the 34-year-old ethnic studies teacher whose image has been used as a poster and on billboards and full-page LAT insert in support of the strike. Despite these challenges, however, I still feel that the coverage was solid, and much improved over last year. And these improvements couldn’t have happened at a better time, given that other strikes loom as possibilities in places like Denver and Oakland. Looking down the line, I’m hoping that the Education Writers Association or some other support organization will provide some training and support for journalists who might be called on to cover teacher strikes during the remainder of 2019. Meantime, check out some of the coverage cited here and see what you think. Or feel free to read some of the many related columns that have been published here in the past on strike coverage, which may help you understand and avoid the pitfalls that can undo a reporter’s work when covering a strike. New York City 1968 wasn’t a teachers strike; it was a community insurrection.